This article is about the Morrissey album. For the band, see Viva Hate (band). 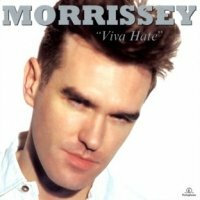 Viva Hate is the debut solo studio album by English singer Morrissey. It was released on 14 March 1988 by HMV, six months after the final album by the Smiths, Strangeways, Here We Come. Although credited to Morrissey and producer Stephen Street, the Durutti Column's guitarist Vini Reilly, who had been drafted into the sessions by Street, later claimed every song on the album except "Suedehead" had been composed by Morrissey and Reilly. Street has denied this. In an interview in 2014 Vini Reilly said "I want to talk about Stephen Street about whom I've said wrong things in the past; this is not an excuse, this is fact, I have suffered from what they call 'displaced anger' and this is where you're very angry with yourself and you don't understand, you just shout at people you really care about." EMI Australia considered Viva Hate too harsh a title and renamed the album Education in Reverse for LP release in Australia and New Zealand, the same title appearing as an etching on the vinyl. The album was recorded between October and December 1987. Viva Hate was released on 14 March 1988 by record label HMV. The track "Margaret on the Guillotine", which described the death of then-prime minister Margaret Thatcher as a "wonderful dream", led to Morrissey briefly being questioned by the Special Branch. The American release included the track "Hairdresser on Fire", which had been released in the UK as a B-side to "Suedehead", as track 9. This same track was released on a 7" single that was sold with the album in Japan. It was certified Gold by the RIAA on 16 November 1993. In 1997, EMI, in celebration of their 100th anniversary, released a remastered special edition of this album in the UK. It features different cover art and a different booklet (it has a photograph of a billboard for Beethoven Was Deaf and drops the lyrics) as well as eight bonus tracks – only one of which was contemporaneous with the album. "Hairdresser on Fire" does not appear on this version. A newly remastered, special edition of Viva Hate, supervised by Stephen Street, was released on 2 April 2012. This edition controversially omits, along with the name of Vini Reilly, one of the original album's tracks, "The Ordinary Boys", and includes the session outtake "Treat Me Like a Human Being". Also, the extended fadeout of "Late Night, Maudlin Street" has been changed. Stephen Street has said that he felt these changes were a mistake but that the track selection was changed at Morrissey's insistence. "Hairdresser on Fire", again, is also not included on this edition. Additionally, the typeface font on the front cover had been changed. Viva Hate was generally well received by critics. Rolling Stone called the album "a tight, fairly disciplined affair", in comparison of its sound to that of The Smiths. In its retrospective review, Pitchfork called the album "one of Morrissey's most interesting records, and certainly his riskiest", and that its "strange mix of pomp and minimal languor makes Viva Hate the only Morrissey LP you'd consider listening to just for its music". A negative review came from Spin, who wrote "without guitarist/composer Johnny Marr at his side, the mahatma of mope rock seems to have gone out for a nice depressing stroll without noticing that he didn't have a stitch to wear". 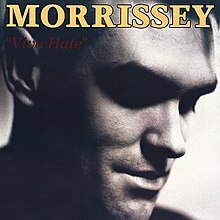 Viva Hate was listed by Q as one of the top 50 albums of 1988. The album was also included in the book 1001 Albums You Must Hear Before You Die. All tracks written by Morrissey and Stephen Street. ^ "Morrissey - Viva Hate at Discogs". discogs.com. Retrieved 28 July 2016. ^ Autobiography (2013), p. 390. Penguin Classics. ^ a b Kinney, Fergal (23 February 2012). "Stephen Street – Exclusive Interview". Louder Than War. Retrieved 8 December 2014. ^ Hann, Michael (18 October 2013). "Morrissey Autobiography: 10 Things We Learned | Music | The Guardian". The Guardian. Retrieved 8 December 2014. ^ Erlewine, Stephen Thomas. "Viva Hate – Morrissey". AllMusic. Retrieved 8 December 2014. ^ McLeese, Don (6 April 1988). "Morrissey rises to meet solo challenge // Ex-Smiths singer feels better with 'Viva Hate'". Chicago Sun-Times. Archived from the original on 12 March 2017. Retrieved 11 March 2017. (Subscription required (help)). ^ Kot, Greg (7 July 1991). "The Smiths And Solo". Chicago Tribune. Retrieved 3 May 2016. ^ Willman, Chris (27 March 1988). "Morrissey as Solo Artist". Los Angeles Times. Retrieved 3 May 2016. ^ Jackson, Alan (19 March 1988). "Education In Reverse". NME: 30. ^ a b Ewing, Tom (28 March 2012). "Morrissey: Viva Hate". Pitchfork. Retrieved 8 December 2014. ^ "Morrissey: Viva Hate". Q (72). September 1992. ^ a b Coleman, Mark (19 May 1988). "Viva Hate". Rolling Stone. Retrieved 8 December 2014. ^ Christgau, Robert (28 June 1988). "Christgau's Consumer Guide". The Village Voice. Retrieved 3 May 2016. ^ Altman, Billy (June 1988). "Morrissey: Viva Hate". Spin. 4 (3): 72. Retrieved 8 December 2014. ^ "Rocklist.net ...Q Magazine Recordings of the Year". Rocklist.net. Retrieved 8 December 2014. ^ Kent, David (1993). Australian Chart Book 1970–1992 (Illustrated ed.). St. Ives, N.S.W. : Australian Chart Book. p. 208. ISBN 0-646-11917-6. N.B. the Kent Report chart was licensed by ARIA between mid-1983 and 19 June 1988. ^ Steffen Hung. "Morrissey - Viva Hate - dutchcharts.nl". dutchcharts.nl. Retrieved 28 July 2016. ^ "Offizielle Deutsche Charts - Offizielle Deutsche Charts". offiziellecharts.de. Retrieved 28 July 2016. ^ Steffen Hung. "charts.org.nz - Morrissey - Viva Hate". charts.org.nz. Retrieved 28 July 2016. ^ Steffen Hung. "norwegiancharts.com - Morrissey - Viva Hate". norwegiancharts.com. Retrieved 28 July 2016. ^ Steffen Hung. "swedishcharts.com - The Smiths - Meat Is Murder". swedishcharts.com. Retrieved 28 July 2016. ^ "viva+hate | full Official Chart History | Official Charts Company". officialcharts.com. Retrieved 28 July 2016. ^ "Morrissey – Chart history | Billboard". billboard.com. Retrieved 28 July 2016. ^ "British album certifications – Morrissey – Viva Hate". British Phonographic Industry. Select albums in the Format field. Select Gold in the Certification field. Type Viva Hate in the "Search BPI Awards" field and then press Enter. ^ "American album certifications – Morrissey – Viva Hate". Recording Industry Association of America. If necessary, click Advanced, then click Format, then select Album, then click SEARCH.